Tony, a retired Marine engineer, found out he had asthma by accident. Treatment by steroids provoked the development of a number of other conditions, like diabetes, and this pushed him to start searching for alternative methods to manage his health. Hello Tony, can you please introduce yourself in a few lines? My name is Tony Preston I am 74 year old widower and live in Roydon Diss , Norfolk. I am a retired Marine Engineer but keep myself as active as I possibly can. I suffer with a number of problems, Asthma, Bronchiectasis, Diabetes, Adrenal Suppression. I served nine years in the military and part of my training was in Norway. The day started with a six mile run in full battle gear. Return to the camp, break the ice on the fjord and jump in. Each day the time of immersion in the water was increased by a couple of minutes, all this to acclimatise us for canoe expedition into colder parts. After this bout of training, the Aden troubles started in the early sixties and I was drafted out to the Radfan Mountains in Aden. I went from minus temperatures to plus 100 F. I also did a station in Sharjah near Dubai with the Trucial Omen scouts. How and when were you diagnosed with asthma? What symptoms were you having and how were they developing? I then returned home to England and came out of the army. I wanted a job and a house so I took a tied house on a farm near Salisbury in Wiltshire as a farm engineer doing all the repairs. One day one of the tractors broke down on the top of the fields on a 4000 acre farm. I went to fix it and the driver went home in my Land Rover leaving me to complete the work. I was found collapsed beside the tractor at 2am in the morning almost expired. I was rushed into Salisbury hospital and in intensive care for a week. I was not wanted up above and the hospital started all sorts of tests trying to find out why I suddenly stopped breathing which was getting progressively more difficult to breathe in hospital. What treatment were you prescribed? How efficient was it? The wonder drug then in its infancy was steroids, mine made from the pituarity gland of a pig named ACTH. It was in jelly form in a vial and hand warmed before injection.. This was not enough to relieve my symptoms so they tried other types of steroids many in use today. I was finally in the hospital for 18 weeks and returned to my tied house still quite weak and ill. I was sent to the common cold research establishment near Salisbury to try to discover if I had any allergies. It came out that I was allergic to grain, pollen, house dust, and bed mites - the little bugs that live on us and in our beds. As soon as my employer discovered I was allergic to grain pollen that was my job gone and my home. Through the years until the 80s I faced great heart ache and difficulties trying to find work because I was honest. Any prospective employer once told of any illness showed you the door. So I did my survival course again and told lies about my health and secured a job. All during this time my asthma had slowly worsened and my intake of steroid increased. Apart from asthma, you have a number of other conditions, including diabetes, arthritis, bronchiectasis and adrenal insufficiency. How did you develop these conditions and what helps you manage these conditions? I was informed in 1988 that I had diabetes attributable to steroids, I had five attempts at weaning me off steroids and each time I ended up in hospital. I was then informed I had osteoporosis in my femur of my left leg also attributable to steroids. I began to do research of my own because my diabetes was depressing me as I had been prescribed insulin. I am a lover of sailing and was on the wall at East Cowes Marina doing my injection, and I accidently kicked it all into the sea. There was a great flap around getting the police to open a local pharmacy to replace my insulin I had given swimming lessons. I thought to myself I cannot live like this and started real earnest research on alternative medicine. One of the scariest problems I have through the steroids is the adrenal suppression, whereby your body makes a certain amount of steroids that we all require to function, all on its own. When you have been on steroids for a long time, the adrenal glands responsible for its control decide that if you are going to take this stuff through your mouth, we are going to stop making it. And they stop altogether. Reading about this problem does not help because there is nothing can be done about it medically, just careful steroid control. You’ve mentioned that you started the research on your conditions in order to find the alternative ways to get better. What alternative medicine are you using and how does it improve your health? I discovered a product - freeze dried garlic which stated the intake of two tablets daily, but as it is my character, I took six daily. My blood sugars dropped dramatically over a period of four weeks and I went to my support nurse and told her. She made an appointment for me to see the specialist who said it was not that but I insisted and I by then was about to stop my morning 40 units by increments of two. This I completed and became diet controlled for 18 years when my sugars crept up slightly. I went onto tablets and have controlled it that way since. During all this experimenting with my diabetes my asthma kept reasonably well, with not to many flare-ups and attacks. Again I had read about the ins and outs of asthma and had been trying various alternative medications. 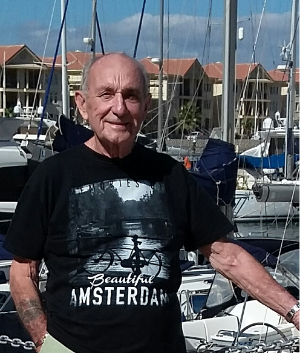 I developed Bronchiectasis and became very depressed as this was seriously affecting my sailing, but I persisted and then one day travelled to Mauritius and discover that the constant warm weather made my breathing perfect. When I returned home I experimented with keeping my bedroom at a constant temperature of 65/70 f this helped immensely. I have not used one inhaler since January of this year 2016 and I am able to walk up hills, my sailing is so easy now. It is well known that diet is an important factor for improving your health. Do you personally follow any special diet due to your conditions? The one thing that has helped me is my eating. I do not eat very much tinned or packet food, most of my food is fresh with lots of vegetables and fresh fruit. When I first started on steroids I went up to twenty one stone, this frightened me and made me observe. I am not on a strict diet, I just eat less and drink more water and it has worked - I am now 11 stone. Do you think that sharing with other people suffering with the same condition can help patients find encouragement and strength to keep fighting? I think that sharing my story will maybe help someone, if it just one. I have achieved something and helped someone with these problems that face people like me. In the beginning when these problems started to mount up I was scared, I thought I was going to die but I have got to 74 and still going strong. The only event which really did knock me backwards in my health was the death of my wife in April. I cannot combat loneliness no matter how much I read and research. What message would you like to share with other patients? I would like to say before I end, become knowledgeable about your health problem, don’t just leave it to the doctor and the professionals, seek out alternatives, talk with your doctor and don’t give up when the first one does not work, try again, read some more, ask questions, find out why and what, be inquisitive about your problem. Some doctors do not agree with alternative medicine like my diabetes consultant. Just ask that what you intend to try does not conflict with anything you are already taking and then try and try again.